When you saw my bag for August, I bet you started thinking, hmm, I wonder if that can be made out of quilting cotton... well guess what? It can! 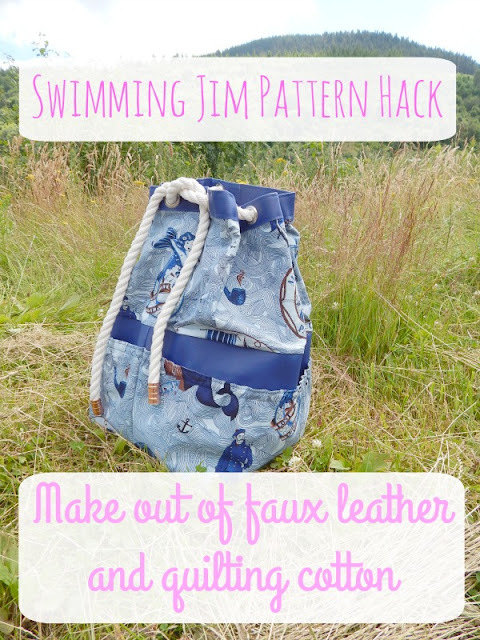 I'll be hosting a sew along on the blog here this month, and instead of following the pattern as it's written, I'll show you how I used it to make a Swim & Gym bag from faux leather and quilting cotton! To prepare for sewing you'll need to print pattern pieces A - Bag base outer & E - Outer Mesh pockets from the pattern, you'll also need C - Strap tunnel, and if you wish, D - Strap slider. I didn't use a strap slider on this pattern. Cut 2 Outer top from your quilting cotton, and two from medium weight interfacing. These will need to be 23 1/4" W x 9 3/4"H.
Using the pattern piece A Bag Base, cut two pieces from your lining, that are 24" tall. This means you'll need to add 8 1/4" height (from the red line), or 7 1/8" height (from the black line) depending on where you have previously cut your pattern piece. This hack still has very little stabilisers, so if you want to add a foam stabiliser, you should cut it to match the lining and attach to the lining, rather than the outer. This will help keep it's slouchy shape, whilst still giving stability. I used 17mm eyelets, and 1/2" rope. I know, mixed measurements. What can I say, I'm bilingual! Come back on Tuesday for part 2 and we'll start sewing then!